Brussels sprouts happen to be one of my favorite vegetables. It wasn’t always that way. I grew up in a house that had banned Brussels sprouts. When my parents got married, they made a pact that they would never have to eat liver or Brussels sprouts. I suppose their parents forced those foods upon them. B: Yick! Really? You’re going to eat them? They’re disgusting. R: You didn’t even know what they were. How do you know they’re disgusting? Have you ever had them? B: No. My parents wouldn’t eat them. R: Well, you’ll have to try some. If you don’t like them after than, then you can say they’re no good. B: OK, let me know when they’re ready. Well, I didn’t hate them after all. I can’t say it was love at first bite, but they were much better than I expected. Your parents aren’t always right. My next encounter with Brussels sprouts was a few years later. At my first full-time job after college, the boss took our department out for dinner to celebrate the holidays. We went to a fancy restaurant. I don’t remember much about it except one thing. When our meals were served, the woman I sat next to had ordered liver and Brussels sprouts for her dinner. I couldn’t stop laughing at her. After all, my parents did make that pact. I couldn’t wait to call my parents. I was finally sold on Brussels sprouts in California. I went to the Bay area to visit my friend Paige for Thanksgiving. We picked up some farm-fresh Brussels sprouts, still on the stalk. Have you ever seen how they grow? It’s surreal. Check out this picture. It looks more alien than earthly. We cooked them for Thanksgiving dinner, and I was hooked. Usually I roast them until they are falling apart, but it takes a long time. I recently discovered a much faster way. This recipe won’t replace the long-roasted one, but it’s a nice alternative on a weeknight. Slice the Brussels sprouts in the food processor, using the ¼ inch (6 mm) blade. There should be about 5 cups. Place the bacon in a large skillet, add the oil, cover, and cook over high heat for 2 to 3 minutes, until the bacon is crisp and brown, and most of the fat is rendered. 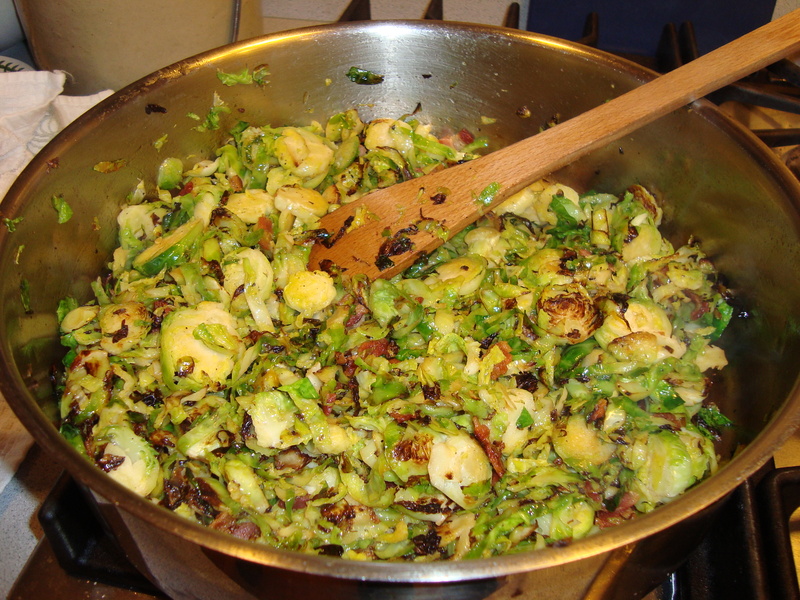 Add the sliced Brussels sprouts, salt, and pepper, cover, and cook for 1 to 2 minutes to soften. Uncover and cook over high heat, tossing occasionally, for about 2 minutes, until tender but a little bit firm.